The poem considers two aspects of hiding – one from the world and one from yourself. The woman in the image is inside a room, lock and barred against the outside world. There is a doorway behind her, but it seems to be impassable, and there are windows, or are they mirrors? This uncertainty, this impossibility makes the woman appear trapped in the space, but she seems detached, preoccupied. Well, not quite detached, on her lefthand she wears a ring, suggesting she is married. Rossetti’s poem speaks of an inability to overcome the greatest enemy, herself. Hers is not specifically a voice of doubt, but of one that craves an easy life, a ‘coward’ ‘who craves for ease and rest and joys’. Rossetti’s rage against this inner ‘traitor’ can be seen as her unwillingness to sit and be peaceful like women were expected to be. There is a definite tension between her desire to start on ‘the race that all must run’ and to lock herself away from the world. However, I think she actually means that to lock the doors upon herself, to lock others out is the easiest thing, but then it leaves the greatest foe in there with her. In Rossetti’s poem there is hope in the shape of God, but as the poem takes the form of a plea, it can be assumed she feels unanswered. In the painting a chain dangles unnoticed by the woman with a tiny silver crown, glinting. It seems to be entagled with the central iris. The iris themselves pose another mystery. In the language of flowers they have a very feminine meaning, referring to the goddess Iris, and speak of wisdom and passion. These seem to have dried out, preserved in a faded state, possibly referring to the woman who will burn herself out while she frets and struggles with her own intellect. I don’t think this is a criticism from Khnopff as the flowers are magnificent in their decay. The woman’s eyes seem so pale as to almost be sightless. 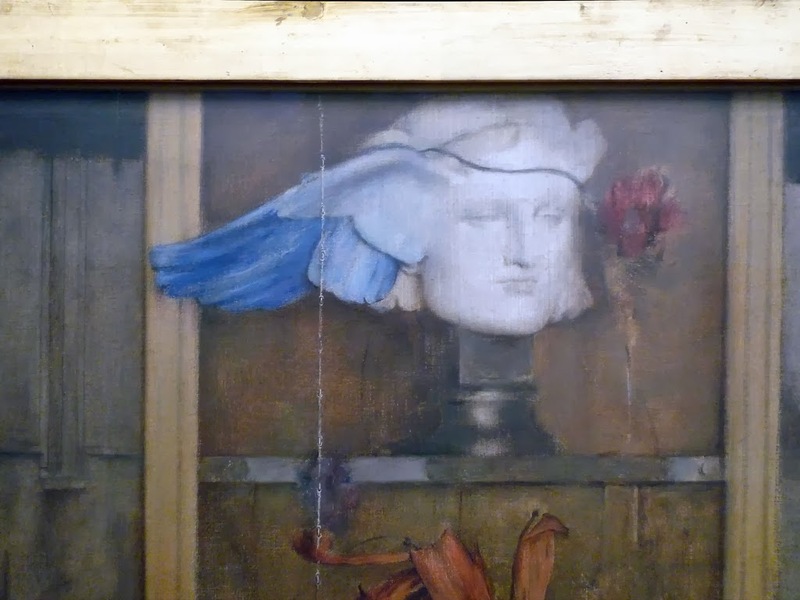 The blue is echoed in the fabric that seems to brush her on the surface in front of her, and the wings on the bust of Hypnos on the shelves behind. Hypnos is the Greek personification of sleep, as hinted at by the poppy beside the bust. Hypnos lived in a cave with no doors or windows, and the river of forgetfulness, Lethe, flowed through. I think the fabric in front of her references the river, as if the woman longs for the peace of a blank mind, but she is not drawn into it as she drifts. 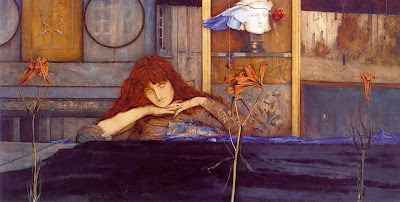 The painting reminded me first and foremost of illustrations of The Lady of Shalott. The Lady wishes to be part of the world, to leave her prison, where as Rossetti wishes to lock herself away, but both are dissatisfied with the manner of their existence and the peril they find themselves. For the Lady, the conflict is with an unseen force, a curse that she cannot fight, that comes upon her when she is drawn into action. 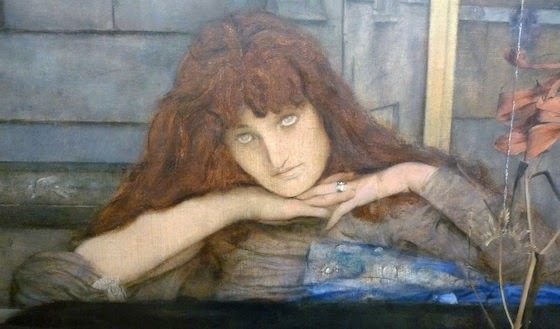 For Rossetti, her participation in life causes her inner conflict that ultimately make her flee. Look beside the woman – there is an arrow. Is it love she is thinking of, or trying not to think of? It was love that doomed the Lady of Shalott, will it prove to be the undoing of this woman's peace of mind too? Khnopff's finished image is not the only time he used the poem as inspiration. 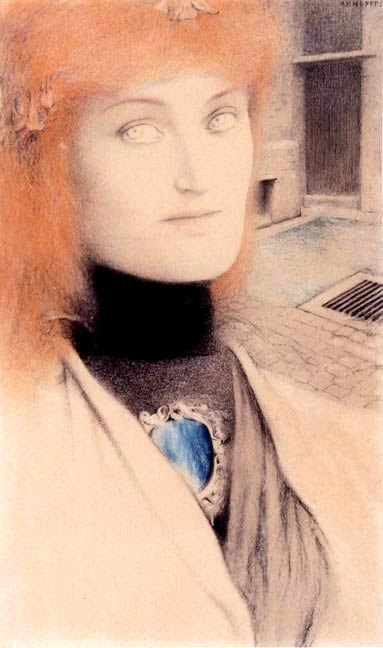 This fire-haired beauty is yet another woman in conflict with herself. The pool of blue on her chest may reference the previous image, and she seems completely locked up in her clothing. The background is a confusing mash of grates, crevices, floors all leading nowhere. Again, her colourless eyes gaze to us, beyond us, back deep inside herself. Ultimately, there are lots of 'individual women in closed rooms' pictures in Pre-Raphaelite and associated art. Think of Dante Gabriel Rossetti's women of the 1860s and 70s: there are scores of women in their own little prisons. Did he recognise what his sister had vocalised? It seems rare to see such a picture of a man, in fact there are few, if any, images of men separated from the world in such a purposeful way. Maybe what Rossetti identified and admitted to was a weakness of high intellect - with great thought comes unlimited, unstoppable threads of woe from the person who knows you and your weaknesses the best. No matter how much you hide from the world it takes the ultimate strength to silence the clammer inside. Well I would think that all the "women in closed rooms" references the types of lives woman had in the past. Like The in Yellow Wallpaper; where a woman who desires to have an active intellectual and creative life outside the sphere of home and family is driven to insanity by her desire? Women were expected to be dainty, quiet, peaceful and their place was indoors. So maybe that is what all these paintings are exemplifying, no? Thank you for your comments. That is definitely what the poem is saying and presumably what Rossetti felt most keenly herself. However the painting I think may be saying something else, possibly that women are apart, have the luxury of separateness that possibly Khnopff envied? I do wonder if Symbolism is the natural bridge between Pre-Raphaelitism and Surrealism and of course the attitude towards women in Surrealism is more one of separateness, of madness. However much I love the work of the Surrealists, it is always the aspect that makes me uncomfortable. That's an interesting point you make Kirsty. 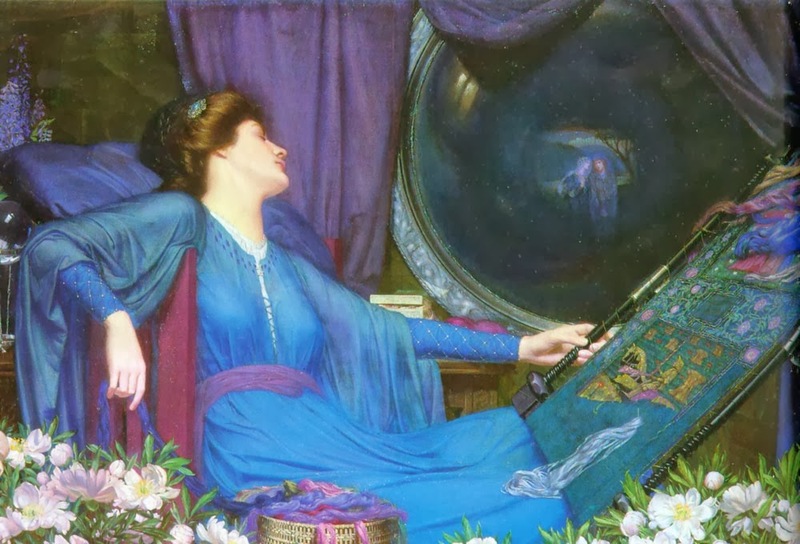 The continuing criticism of the Pre Raphaelites is that their movement was an artistic dead end. I like you felt that they lead to Symbolism and ultimately Surrealism. (Not forgetting the arts and craft movement which obviously influenced the Bauhaus). Very interesting to see how Pre-Raphaelitism spread further than England in the late 19th c. when it is often regarded as a truly British movement detached from the continent. The book 'The age of Rossetti, Burne-Jones and Watts: Symbolism in Britain, 1860-1910' I think argues that symbolism started in England, but doesn't show how it influenced the symbolists in the continent when you have very clearly shown they did some extent. Thanks for your comments. Yes, Watts is undoubtedly a symbolist and arguably Burne-Jones is too. 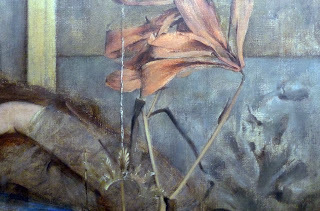 It's easy to see Burne-Jones in Khnopff, not only in subject but in that odd, powdery finish that makes you think you are dreaming a picture. It is about time that the art history world acknowledges what we all know: Pre-Raphaelitism fits in with the story, it isn't just an odd footnote.